The big 10th anniversary UK Games Expo has just finished, and boy was it something! This year they moved into the Birmingham NEC, probably with a little nervousness However by the end of Sunday they had nothing to worry about. The event was simply fantastic! Thursday was set-up day and the retailers talk held by Esdevium. The hall was much bigger than the Hilton and there were so many retailers that the conference room could not fir them all in. Friday was the warm-up day for things to come. Saturday was crazy and Sunday was a little quieter. So summing up the organisers and volunteers….you deserve a very well earned rest and a wee treat, no, we mean a BIG treat. 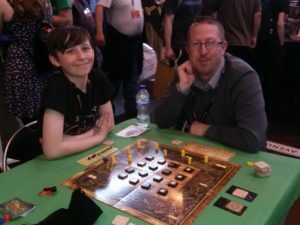 It was simply the best UK Games Expo ever! From Backspindle perspective we had Clacks! on sale at the Expo for the first time. We also were releasing our new pocket sized game, Codinca. In addition we also had some of the last remaining stock of Guards! Guards! and copies of Luchador! on sale too. 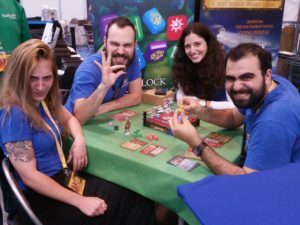 All our games were thoroughly enjoyed and we had so many wonderful comments from gamers, industry leaders and podcasters it made us, as a team feel fantastic. Thank you all for your kind words. Even our neighbours Drawlab, all the way from Greece were wonderful…and they totally got into the crazy fun world of Luchador! Mexican Wrestling Dice as you can see below. One of the highlights of our weekend was our Speed Codinca Tournament. The standard was really high and the final was riveting. It was between young Tom and David and went down to the final one v one tile to win after David had stormed into a three to one lead. The tournament was topped off by Sam Healey from The Dice Tower who kindly offered to present the prizes to the two finalists. As for the Codinca release, we sold out! However for all you pre-order customers, don’t worry, we are actually ahead of schedule and have set aside a few copies to get out to you by next week. We met a number of games designers who showed us their ideas and also play-tested a new idea in the Playtest UK area on Sunday morning. A massive thanks goes to all of the organisers of the Expo and our two workaholic volunteers Andy and Robin. You guys were awesome! If anyone is keen to volunteer with us at future conventions please get in touch by our email or social media. 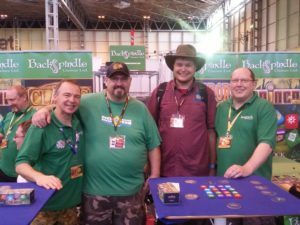 Our Sunday ended with the charming chaps from The Dice Tower, Tom Vasel & Sam Healey popping by and the equally charming Ross Jepson from Steve Jackson Games. 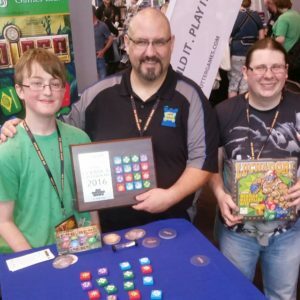 Next up for us is Q-Con in Belfast on 17 – 19 June then we will be off to….Gen Con, Indianapolis, for our first ever visit from 4-7 August. We will be guests on our US partners Ninja Division‘s booth. Following this we may get a day in Philadelphia. If any fans are keen to show us around, please get in touch. Finally, in August our David will be a guest at Discworld Convention in Warwick. Till next time, have a wonderful summer! « Codinca now on pre-order!